In a medium-sized pot, bring the green beans to a boil in 4-6 cups of water and 1 tablespoon of salt for 5 minutes. Carefully drain the beans and rinse with cold water. In a salad bowl, mix the green beans with the peppers, red onion and the Italian dressing. Let it rest in the refrigerator for around 2 hours to let the flavors mix. Add the orange segments before serving and garnish with chile de árbol flakes. You can replace the Italian dressing with your favorite vinaigrette. For an extra special touch, you can also garnish your salad with parmesan cheese and almonds. No one likes to spend hours in the kitchen during hot days. During the summer, I love to grill meat, chicken and shrimp in the outdoors grill. But our meals are not just about meat. My family and I always prepare something to accompany our grilled meals. 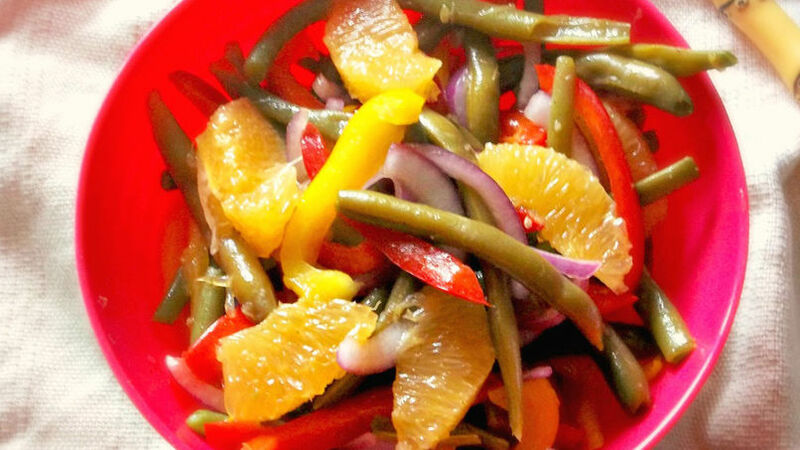 One of my favorite salads is this colorful salad with green beans, peppers, red onion and orange segments. With this fresh and delicious salad, you won’t spend more than 5 minutes in front of the stove!